Aries is courageous and confident, unafraid to climb or push forward much like its animal symbol, the ram. When the full moon peaks in this fire sign, it's a call to us to stand up for ourselves, ask for exactly what we deserve and persevere. As such, I focused this altar on recent changes in my life and my Craft as I move forward into a new era. If I'm going to focus on recent changes specific to my Craft, what better way to do that than to include the item I utilized as an offering/vessel for the Man in Black back in my August Eve ritual? This is the centerpiece of his altar in my ritual room now. Between its use as a vessel and upon my altar, it has become a sort of icon for my move into Trad Craft. It certainly helps that this is a ram's skull, further linking its purpose to the Aries altar. As the sign of the ram, Aries is about pushing forward into the unknown. I'm certainly doing just that as I dive into a more traditional take on witchcraft. On top of the ram's head, I placed a red lava rock. Inevitably associated with the fire element, lava rocks are also a foundation of courage and strength. By placing this stone upon the icon of my Craft's evolution, I am invoking the courage to move forward. On either side of the ram's skull, I constructed offerings of candles, herbs and stones relevant to the full moon in Aries and also invoking what I need to make it through this change. On one side, I placed a ring of red jasper around the candle and nettle underneath. Red jasper is a symbol of flexibility and nettle grants courage while repelling negativity. Moving forward, I hope to find flexibility and courage while repelling the negativity of my past. 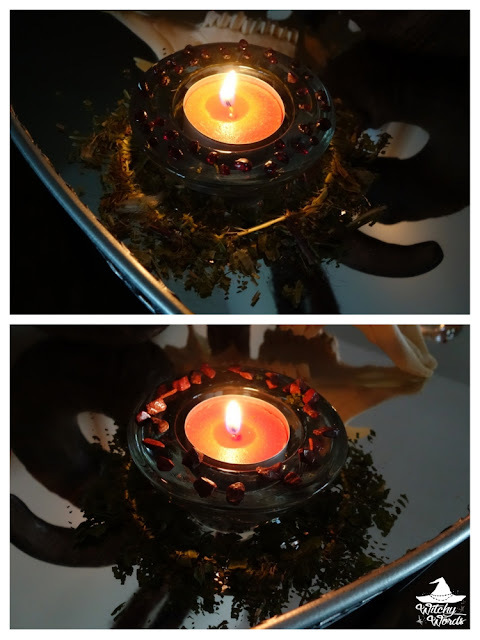 On the other side, a ring of red garnet slices invokes the protection of fire while the blessed thistle around it calls upon the spirits that I seek to work with. As my Craft has taken a nose dive deep within spirit work, this seems like an appropriate combination as an offering on this altar. The center candle for each offering was orange, a color of opportunity and success. I hope that, within this change moving forward, I find the many opportune pathways and navigate them successfully. 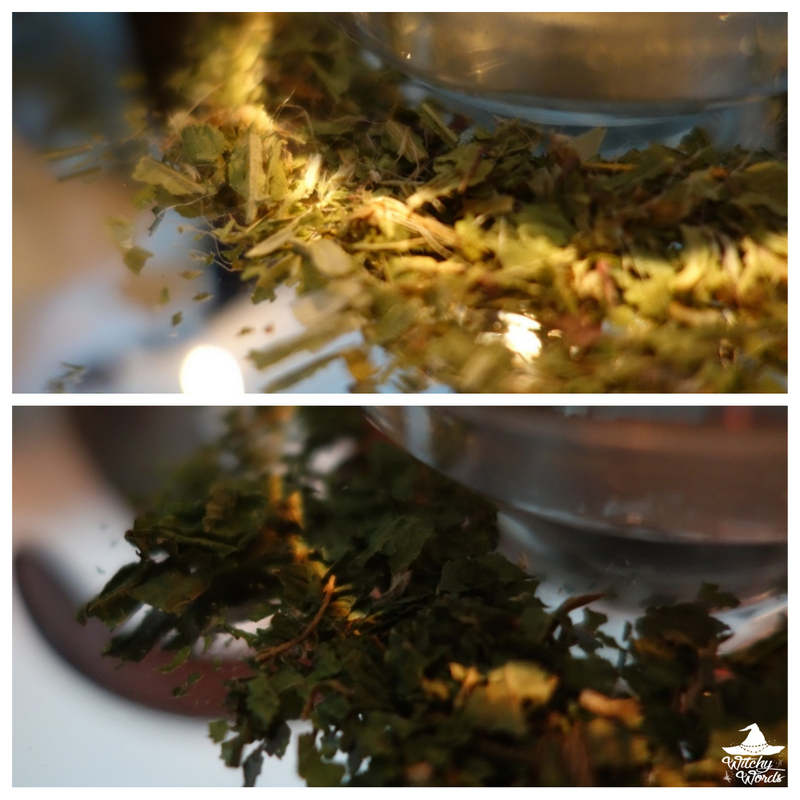 When lit, each candle cast a beautiful halo of light upon the herbs below, illuminating their correspondences upward. I also placed a large piece of red jasper, again to promote that flexibility. It's something I often lack yet something that is so necessary to persevere. On either side in the back, I placed a cauldron with a yellow candle inside. Yellow is a color of inspiration and the cauldron is a symbol of new beginnings. Within this new beginning, I hope to be inspired both within my own personal life and within my Craft. Finally, rising above the altar in the back is a while candle. For this altar, it invokes peace and truth. Above everything else, as I move forward, I do so by living my truth and with the utmost peace. Overall, Aries is a sign of standing up for ourselves and finding the courage to persevere. By doing just that, I invoked a number of changes in my life, both personal and spiritual. As I move forward into the Trad Craft experience, I do so by invoking flexibility and courage, protection and spirits. I ask that I'm able to see the many pathways before me and navigate them with success, that, within this new beginning, I find inspiration and that, above all, I am armed with my truth and peace. 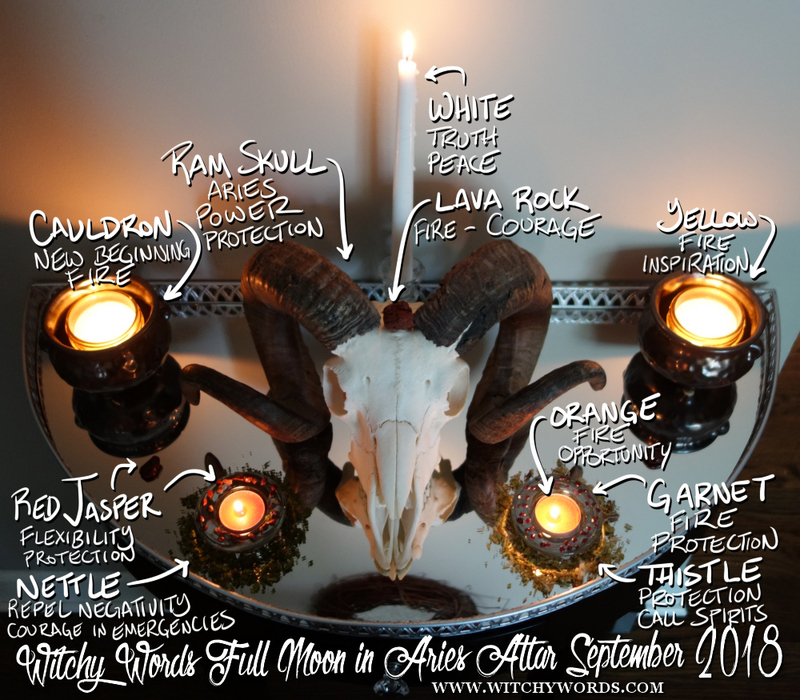 This altar encapsulates those many meanings that are true to both my personal life and to the full moon in Aries. I'll leave you with a visual dissection of the altar above. Enjoy!